Katy Perry and Orlando Bloom are reportedly engaged, after a three-year on-off relationship. 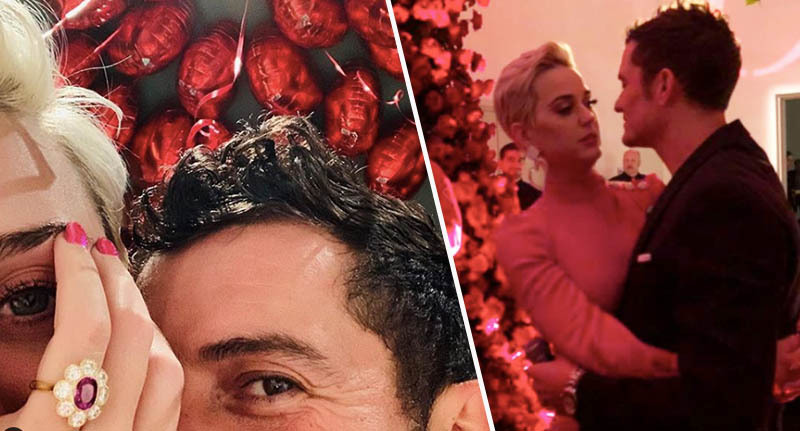 The couple were pictured standing beneath a heart-shaped arch in photos which emerged on Valentine’s Day, with the actor holding Katy in his arms. The photos of the apparent proposal belonged to a Facebook account claiming to be Katy’s mother, and showed the Dark Horse singer crying as she looked at Orlando. Katy was wearing a pink dress to match the engagement ring, which was in the shape of a flower and matches the diamantés stuck to her fingernails in one of the pictures. The pair, who have been in an on-off relationship for three years, looked loved up as they cuddled up to each other in the pictures. Adding further fuel to the fire, the 34-year-old singer posted a picture of the loved up couple to social media earlier today (February 15). In the picture, Katy was sporting the same ring as in the picture posted to Facebook – leading many to believe this confirmed the couple’s engagement and writing messages of ‘congratulations’ underneath the picture. The couple were first linked in January 2016 at the Netflix Golden Globes after party; Katy and Orlando reportedly even had a dance off, in a scene straight out of a rom-com movie. For the next year, they were regularly spotted looking extremely loved up; attending an Adele concert and Coachella together, and even jetting off on holiday for a spot of paddle boarding (you know which pictures I’m talking about). The relationship was finally confirmed in May 2016 – much to the excitement of fans – after Katy shared a very cosy picture of them at the Cannes Film Festival. However, the romance appeared to be off in March 2017, with Katy and Orlando revealing they were parting ways. It didn’t last long though, as the couple were spotted holidaying together in the Maldives at the beginning of 2018. Since then, their romance has obviously gone from strength to strength – resulting in their now apparent engagement on Valentine’s Day.